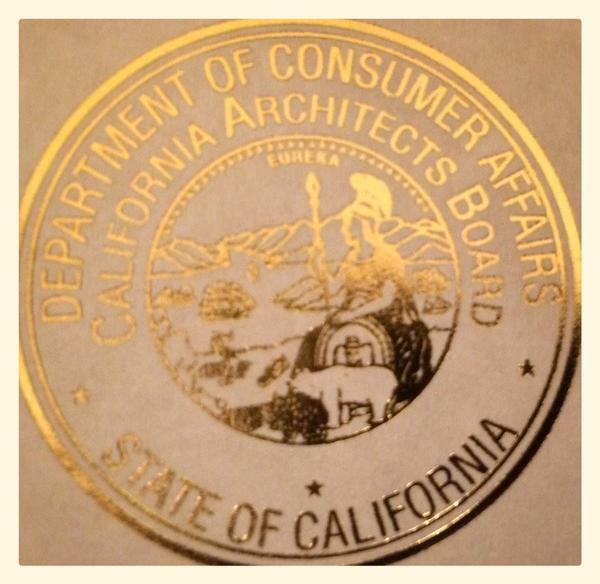 In January of this year, I finally received my California architectural license. To say it was a long time coming would be an understatement. 17 years since graduating from the University of Detroit Mercy school of architecture in 1998. It took me close to 5 years and 11 exams to complete the 7 national ARE exams and final California supplemental exam but I did it on my own terms at my own pace. If there’s anything I learned from the process is that no 2 trajectories to licensing are the same. Hard work and determination are the key just like in life. From 2009 when I moved back to San Francisco from the Netherlands, I began to focus on getting my career up to speed again. I had been, for the previous 10 years, focusing my attention on my other passion- windsurfing. Its a rarity, that architects have an outside passion as the professional takes most of your available time and energy just to stay afloat. Architects tend to work long hours and be very under-appreciated. I tried for a different path. I set up my career as a consultant focusing on architecture and design with a strong suite in presentations. I was able to carve out a niche working with one or 2 architects and set my own schedule- keeping a balance in life and getting out and windsurfing as much as I could- just to keep sane. Before I even began the ARE’s I had to restart NCARB’S intern development program and log approx 10,000 hours of pre-design, design, project management and practice management. This was to make sure I wasn’t getting pigeon holed of just drawing door and window details and that I was getting the necessary steps to become an experienced architect capable of running a firm. Next came the AREs or the Architectural Registration Exams- put out my the same NCARB organization. I spent approximately a year studying for the 1st exam- completely overwhelmed at the amount of material on the Building systems portion. I delved into old university manuals and reference books, trying to recall formulas and figure why and when a hydraulic elevator would be more beneficial over a conventional one. Aren’t there consultants for this type of stuff in the real world? Probably, but in the meantime, I’d need to figure it out for myself and pass the next 7 exams in order to sit for the California Supplemental Exam- the crown jewel at the end of the licensing road in California. One by one, I managed to pass all 7 of the ARE, only having to take 1 exam over with a minor deficiency in the vignette portion. The process was a struggle as there’s no clear study guides or feedback you can get if you fail. NCARB prevents you from talking about the exam so getting evaluations was tough. I spend approximately 6 months preparing for each exam until I knew I was ready. Over the course of 4 years, life moves on, kids arrive. There is never enough time but you make time- in the mornings, in the evenings, on the commute. The software was very cumbersome in the vignette portion of each exam. Imagine a windows 95 based autocad that wouldn’t snap anywhere you wanted it to. I had a specific routine for each exam day- test in the morning, followed by a windsurfing session in the afternoon. Sometimes, the 2-3 weeks of waiting for the result was just as hard as the preparation. I always used that time as a break in studying before I began preparing for the next exam. Next up was the California Supplemental Exam- a tour de force of California architectural laws, regulations, environmental standards and best practices mandatory for architects wanting to practice in California. I studied with the same determination but the amount of info on this exam was beyond anything I had prepared for- even the structural systems exam. After 6 months of prep, I sat for the exam and missed passing by 1 question. Unlike the ARE’s, the CSE gives you your results immediately. Like the ARE, if you fail- you have to wait 6 months before retesting. I picked up where I left off, studying the whole enchilada- page by page with audio companion, AIASF courses and flash cards galore. I delved into the California Architects Practice act- paragraph by paragraph, AIA contract documents and CEQA in full detail. 6 months later, I sat for the exam. This time failing by 2 questions. I was devastated, broken and beaten. I took a month off, contemplating my next move. There was only one- get back on the bus and move forward. For the next 6 months, I found my weakest link and made it the strongest. I studied up on construction administration and tried to get a deeper understanding of the obligations and contractual relationship between the architect, owner and contractor within the context of the AIA contracts. Fortunately, I had a project that involved the regional water control district, BCDC, Army Corp of Engineers, Cal EPA, Clean Water Act, Rivers and Harbors Act & FEMA. I got to see how the agencies interacted and their jurisdictional approvals firsthand. Luck would have it that I had a question on my 3rd CSE attempt that was very similar to my real life experience. I didn’t have the second guess myself as I knew section 404 of the Clean Water Act. Im not sure if I passed by 1 question or aced the entire exam but that was enough to get me over the edge. 5 years and 11 exams later I was done. Number 34914 to be exact. While Ive blogged about windsurfing for many years at stevebodner.blogspot.com , this is my 1st blog post as an architect at sbdesign. I’m going to try to use this space to tell what I do as an architect. I am taking the CSE for the third time too. I heard your story and am proud you made it! i am 53 year old women architect in CA. I started and am still licensed in the state of NY. I moved to CA six years ago hoping to work as an architect. Upon failing the test twice, it is my goal to pass it my third time. I plan to work another 10 years – that is my goal. But i dont want to be thought of as an interior designer only. I want to be an architect as I was in NY. What were your study materials? Seminars? Curious how you passed. I used the whole enchilada series & became familiar with all of the reference material. Not sure about the number of times you can take the test but know there is a 6 month waiting period between each try.